Specially commissioned by us, this figure of Odin is truly remarkable. Featuring his companion wolves and ravens, the wandering god surveys the world through his one eye, whilst clasping his spear, Gungnir and supporting the World Tree on his back. 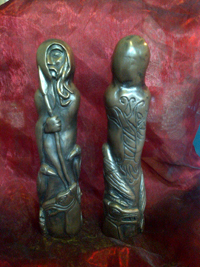 Bronze resin, approx. 18cm. tall.